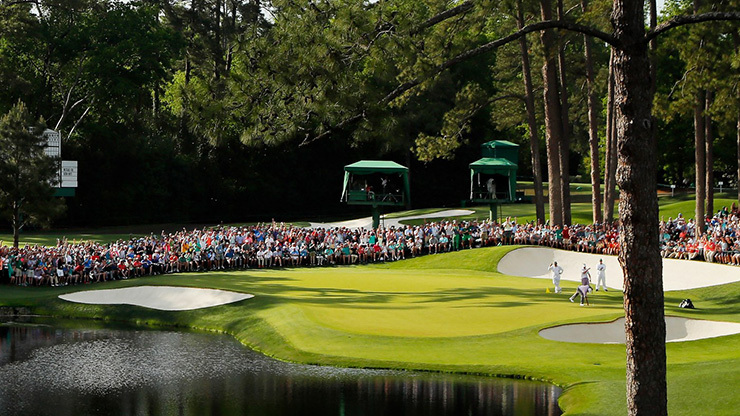 Sound travels at Augusta National. It tells the story, too. Word, that takes a bit longer. No cellphones to text or tweet with, remember, or electronic scoreboards. At 5:40 p.m. on Saturday, Tiger Woods rolled in a seven-foot birdie putt on the par-3 16th, stepping it in circa 2005, like the mock turtleneck he was wearing, before the ball reached the hole. He was tied for the lead deep into the third round of the Masters. A full five minutes later, up on the 18th green, the scoreboard operators flipped the white square on Woods’ line to a red “11” through 16. The thousands encircling the putting surface went nuts. 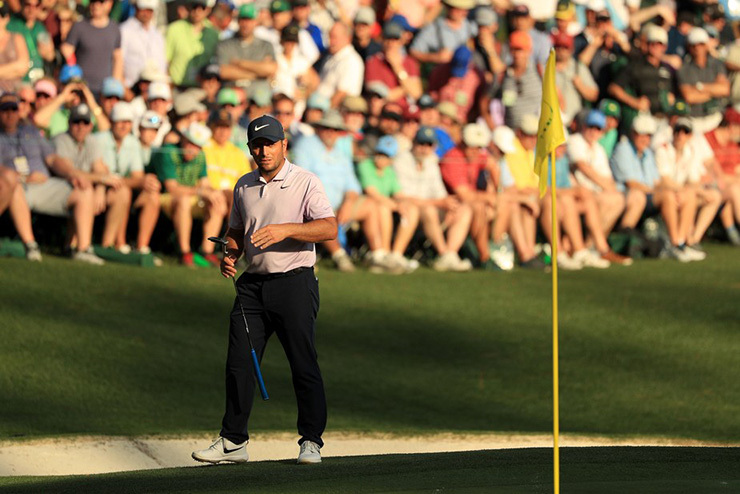 The last five groups Saturday at Augusta National included Woods and Ian Poulter; Justin Harding and Xander Schauffele; Louis Oosthuizen and Dustin Johnson; Brooks Koepka and Adam Scott; and Francesco Molinari and Jason Day, all starting the day within a shot of one another and with 21 major championship titles between them. Of course, Woods has 14 of them, a number he’s been stuck on for a decade. Maybe not much longer. 1:56 p.m.: An official slides a placard with the name ‘Tiger Woods” into place atop a post on the first tee. Ian Poulter is next. A “54” next to Woods’ name indicates when he registered in the 87-man field. Poulter did so later, his number being a 79. Nine minutes until tee time and the duo putt on the practice green behind the first tee. 2 p.m.: The air is thick and humid, and there are 20 or so steps between the green and the tee box. Poulter wipes the sweat from his brow with a towel before making his way down the roped-off gauntlet, acknowledging the crowd as he does. Woods is expressionless. 2:05 p.m.: Woods goes 3-wood, Poulter driver and the two chat as they walk off the tee. Woods takes a few swigs of water. Both find the fairway and green in regulation, each two-putting for par. Poulter the Peacock seems to relish the attention. 2:24 p.m.: Navigating Augusta National is half the battle. At any other tournament, media is allowed inside the ropes. That’ll get you kicked out here, so I follow the walkways across the first, ninth and eighth fairways to get to the par-5 second. As big as the crowds following Woods and Poulter are—four- and five-people deep in spots—there’s a surprising amount of open space here, providing some terrific vantage points. Disappointing pars for both on No. 2, which leads me to ditch them for now. 2:33 p.m.: The scoreboard behind the third tee, which is remarkably close to the seventh hole, shows Tony Finau’s sizzling start—four birdies in his first six holes to tie for the lead at seven under. Fans have been well-behaved so far, though one runs afoul of a security guard. Said guard snaps a picture of the man’s badge as he admonishes him. 2:42 p.m.: Schauffele and Harding are two names that seem out place given their company, though Schauffele has shown some moxie in majors. “Fore right!” Harding shouts from the third tee. 2:46 p.m.: Scott has opened with a birdie, Koepka a bogey, as the two-man board shows near the bottom of the hill on the second hole as they stride down the fairway. 2:50 p.m.: A spot between the right side of No. 2 green and No. 3 tee proves an underrated viewing location, letting you can see parts of three holes with the seventh green close by as well. Bryson DeChambeau lets out a sigh as he walks to the eighth tee, while Justin Thomas, now five under for the week and within striking distance of the lead, looks focused, ignoring the patrons seeking high-five. 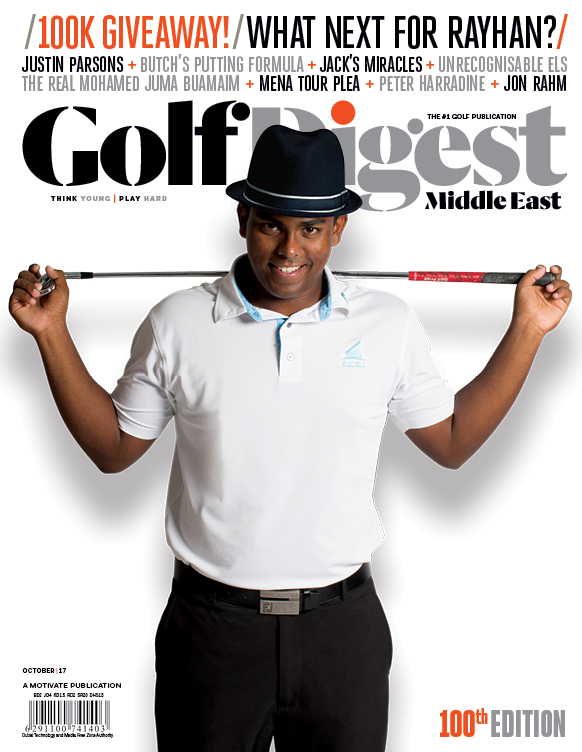 Meanwhile, Finau’s eagle at No. 8 is posted, bringing him to nine under and alone in the lead. No one seems to notice much. 2:58 p.m.: In the right greenside bunker with his second shot on No. 2, Scott slaps his leg in disgust when his pitch scoots past the hole, then he misses the 11-footer for birdie. Missed opportunity given his angle to the tricky back-left hole location that’s just four paces from the edge. Koepka does not miss the opportunity, earning a big cheer in the process for his bird. 3:03 p.m.: After having scrambled across the walkway on the third fairway and up to the green, I see the adjacent leader board shows Schauffele and Harding have made birdies there. Rickie Fowler’s name comes down from the 10th spot and up goes Webb Simpson’s, showing him through 14 holes and now eight under. Moments later, Koepka and Scott each nearly drive the green, but only Koepka gets up-and-down for birdie with a tasty pitch that settles three feet away. Though there’s a good crowd perched right of the green, maybe 100 others are walking along with this group. The big white leader board, meanwhile, shows Tiger has bogeyed the fifth for a third straight day. 3:14 p.m.: A vent in the ground seems to indicate the Augusta National’s famous Sub-Air system is in full blow. That’s how much rain the course has gotten. Speaking of blowing it, Scott gets a nice cheer for sticking it to seven feet on No. 4 but misses the seemingly easy putt. Guess that 45-minute session with the putter that’s NOT in his bag didn’t help much. 3:16 p.m.: A HUGE roar comes from the direction of the 13th hole. Simpson has made eagle to get into contention, now seven under for the week. 3:30 p.m.: The scoreboard left of the fifth green shows that Woods just birdied the seventh hole, his second in a row. 3:39 p.m.: Koepka stuffs his tee shot on the elevated par-3 sixth to four feet. Birdie. You hang a right from the tee and there’s a nice perch from which to see 16. Then it’s down the hill and onward. 3:50 p.m.: Another roar from the direction of 13. Or 15. Both holes provide plenty. Meanwhile, Schauffele has bogeyed No. 7. 4 p.m.: Cutting across the par-5 eighth fairway to get to the ninth, I see that Johnson has uncorked a drive 315 yards up the fairway. He’d make birdie, but he’s just one under on the day. The front nine is continuing to prove difficult. Meanwhile, Woods is tapping in his par putt on 9 and the traffic jam of people trying to get to the 10th tee is akin to Times Square on New Year’s Eve. 4:05 p.m.: Finau’s birdie on No. 13 has gone up on the leader boards. He’s now seven under for the day and the first player to reach 10 under for the week. Other updates include Molinari and Day each making birdie on No. 6, Koepka with a bogey on No. 7 and Schauffele a birdie on No. 8. 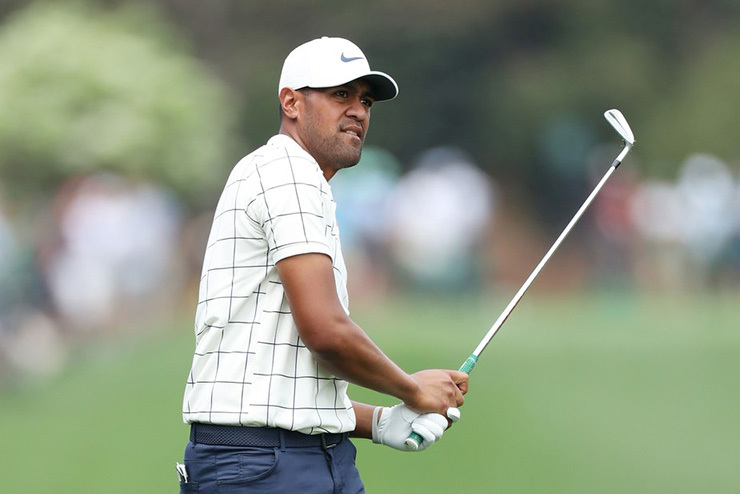 It’s now Finau leading by one over Schauffele and Simpson (who is already in the clubhouse at nine under after a tidy 64); by two over Molinari, Woods and Johnson, who has just birdied the eighth; and three over Day, Koepka, Scott and Poulter. So this is how people used to keep track, eh? 4:20 p.m.: After choosing the less-crowded left side of the 10th fairway (veteran move), I watch between the trees as Woods narrowly misses a 35-footer for birdie. “Here comes the swarm,” one of the security personnel says. No sign of the guy who almost mistakenly slide tackled TW the day before. I do see Poulter’s caddie walking amongst the crowd as he chats with a friend. No need to schlep back to the 11th tee. Joe LaCava, however, goes with Woods. 4:25 p.m.: There’s a middle-aged guy in a walking boot dragging along. With said boot in a plastic merchandise bag. Hey, whatever you gotta do to see Tiger, who gets up close and personal with the fans after blowing his tee shot right on the 11th. Luckily for the 14-time major champion, he’s got a wide-open view of the green, knocks it on and two-putts. 4:35 p.m.: The scoreboard left of the 11th green shows Molinari’s birdie on the eighth. He’s now nine under and one back. Fowler has also birdied 15 to get to eight under. 4:37 p.m.: Here we go. Tiger goes long, Poulter short. Someone yells “Baba Booey!” I guess Augusta National isn’t immune, either. Both manage par. Impressive the Postman is hanging with Tiger. 4:55 p.m.: A man is laying down in the gap between the 14th and 15th fairways. Security approaches (eyes are everywhere) but he wards them off as he waits for water. Back to the golf, Woods’ third to the par-5 13th after laying up short of Rae’s Creek skips to six feet on a back pin. Another birdie. The scoreboard behind 14 tee shows Finau at 11 under through 17 holes; Molinari, Schauffele and Woods all at nine under; Koepka and Fowler at eight under; and Scott, Day and Johnson at seven under. You can also see parts of neighbouring Augusta Country Club through the trees in the distance. That’s if you can see over the crowd, most of which seems to be with (surprise!) Woods’ group. 5:10 p.m.: Finau is in the house at 11 under. Schauffele birdies 13 to get within one. 5:15 p.m.: Simpson, who started the day at one under, and Finau, who began at three under are the biggest movers. Johnson lays up short and right on 13 and pitches close to set up a tap-in birdie. His mom watches from afar and notices that Woods is climbing the board, too. At the same time, Molinari birdies 12 with barely a ripple of noise. He’s now 10 under and charging. 5:33 p.m.: The 15th green and 16th tee are the epicentres, grandstands filled to the brim, and for obvious reasons. Someone notes that Poulter is playing “all right” alongside Tiger. The leader board is still crowded and another notes they want “anyone but Patrick Reed” to win. Wish granted, and Woods chips from behind 15 green to two feet to set up another birdie. He’s now 10 under and one back. 5:36 p.m.: Schnuffele’s second at 15 rolls back into the water, leading to a bogey. “Oooh!” Seconds later, a roar. Tiger has hit it to seven feet on 16. Birdie and tied for the lead. There’s a frenzy developing. 6 p.m.: The back nine isn’t done delivering. Koepka eagles 15 with a towering iron to 10 feet to get to 10 under and within one. Almost simultaneously, Molinari birdies 14 to get to 12 under to extend the lead. 6:06 p.m.: Day follows Schauffele into the water on 15 and makes a crushing double. He’s the only player inside the top 10 who would fail to break par on a perfect day of scoring. 6:13 p.m.: Meanwhile, Molinari delivers another dagger with a birdie on 15. He’s now 13 under, which is where he will finish, parring his way in to shoot 66 and get two clear of Finau and Woods, three better than Koepka and with Simpson and Poulter four back. What an afternoon. Now, are you ready for Sunday?